Question: How can a Major League Baseball Franchise invigorate a fan base while maintaining current payroll and marketing budgets? Answer: Build a website that allows fans to vote on actual player management & line-up decisions - then charge them to have their vote & voice count more. CROWD SOURCING allows fans to infer control of the team while actual ownership retains full equity and final decision. The resulting loyalty translates into dollars spent on gold, silver, and bronze season ticket packages that equate to higher voting power on any decision your general manager proposes to the faithful. DELEGATE player personnel decisions to the FAN BASE. 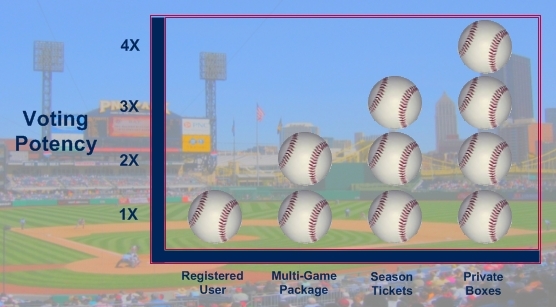 By charging for fan involvement on decisions, success can be measured by voter turnout; not by win/loss percentage. CURRENT WEB TECHNOLOGIES empower a world-wide market to influence programming – the result increases participation directly from the same audience that pays the bills through season tickets and advertising impressions. CAPITALIZE on your general manager's role by having him (or her) earn season ticket sales & advertising impressions. By serving as a filmed programming host, your general manager can document and persuade the fan base to view & process statistics, video, and proposals. Motivate your fan base to actively participate in team management: line-ups, arbitration hearings, free agent bids, trade proposals, minor league call-ups, etc..
As an avid participant in online baseball discussions, I have been able to differentiate messages from many sources and venues. None of these outside venues interact directly with Major League Baseball Team websites. Each of these COMMUNITIES would welcome the opportunity to voice their influence and opinions inside your preferred online venue. The online social network Facebook was successful because it collected friend circles instead of collecting individual profiles. Think of the Official Major League Baseball websites as podiums where such group-to-group communication could be enabled and encouraged. Further imagine how such group input to team management could be monetized - very powerful to the fan base; very profitable for the organization. Consider RECENT MEDIA INDUSTRY TRENDS. Whether with a letter, computer, cellphone, or television remote, crowd sourcing has proven that the audience cares more about programming if they know they have access to be part of it: American Idol, Wikipedia, Digg, Allstar Voting, YouTube, Democracy, Fantasy Baseball, etc... USA today recently had an article on how the NFL is capitalizing on their content by tightly controlling its flow and viscosity. Controlling YES and NESN has made the Yankees and Red Sox more lucrative because a consistent message has been managed directly from the source and throughout its channels. The Schaumburg Flyers are an independent minor league baseball team who tried a similar concept in partnership with Microsoft and LivePlanet in 2006. The project had poor execution bc it lacked a business model and it didn`t consider certain sociological factors amongst fans participating (tribes, leaders, track record, something to loose, & it was run like a promotion instead of like a board of directors). Good businesses listen to their customers; better businesses charge their customers to have their opinions heard and put to action. If given the opportunity, I would first perfect the model with test user groups and the use of sports simulation software such as OOTP. I am very interested in an opportunity to develop such a plan with Major League Baseball. I am a business graduate from the University of Pittsburgh and I have three years minor league baseball experience with the Augusta GreenJackets. I have television experience with Fox Sports Pittsburgh and FootschoolTV. A copy of my resume can be found here and a link to the sports section of my portfolio here. Please consider my aspirations to contribute to your organization in whatever capacity you deem appropriate.